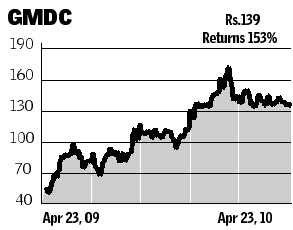 Gujarat Mineral Development Corporation (Rs 139.2): Gujarat Mineral Development Corporation (GMDC) bottomed in December 2008 at Rs 25 and was on a steady uptrend from that level till it encountered resistance in the band between Rs 185 and Rs 190 in January 2010. The stock however has been on a medium-term downtrend from this resistance zone. Since late February GMDC has been consolidating sideways forming a descending triangle pattern (a continuation pattern) with base line or support line at Rs 138. A conclusive breakthrough of this support will slump the stock to next support level at Rs 118 in the medium-term. On the other hand, a reversal from Rs 138 would take the stock to Rs 150 and then to Rs 160 in the same time frame. Short-term stop-loss for the stock is Rs 135. 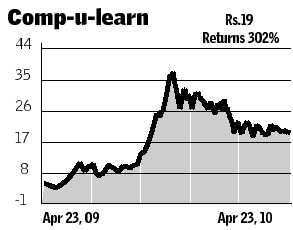 Long-term investors can continue to hold the stock with stop-loss at Rs 100 and a target of Rs 185. 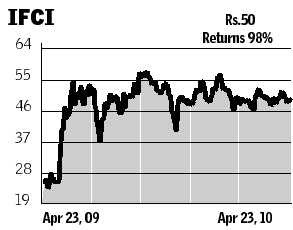 IFCI (Rs 50.6): Taking support in the range between Rs 15 and Rs 17 in March 2009, the stock started to head higher. However, in June the stock's up move met with a significant roof at Rs 60 and began to move sideways. The stock made two unsuccessful attempts to break through the roof in September 2009 and again in January 2010. Long-term investors can remain invested in the stock with stop at Rs 38 and the target of Rs 60 to Rs 65 range. We do not envisage an up move beyond Rs 65 in the next 6 months. Sideways consolidation is in place since early March in the band between Rs 49 and Rs 55. A drop below Rs 49 will give target of Rs 47 or to Rs 44. A weekly close above Rs 55 would re-test the significant resistance at Rs 60 once again. Oil Country Tubular (Rs 118.4): The stock took off after grounding at Rs 30 in March 2009. Finding significant longer-term support at Rs 100 in late March, the stock resumed its uptrend. Short-term trend also is up for the stock while the medium-term trend is sideways with an upwards bias. Investors with longer-term perspective can hold the stock with stop at Rs 87 and target of Rs 145. Immediate resistances are placed at Rs 127 and Rs 135. Supports are pegged at Rs 110 and Rs 100. 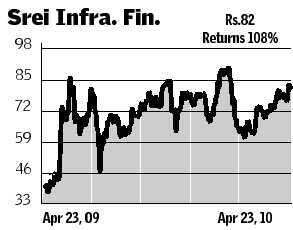 SREI Infrastructure Finance (Rs 82.45): Recording a multi-year low at Rs 22 in March 2009, the stock's long-term downtrend came to a halt. 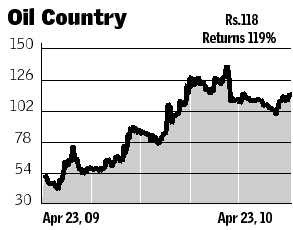 Thereafter trending higher to Rs 90 levels, the stock encountered resistance in June 2009 and has been broadly consolidating sideways between Rs 60 and Rs 90 since then. This sideways consolidation phase appears positive from a long-term perspective. A conclusive breakthrough of Rs 90 will take the stock to the target level of Rs 110 or higher to Rs 130. Investors with long-term horizon can remain invested in the stock with stop-loss at Rs 56. A decline to immediate support level at Rs 70 would be a buying opportunity. Else wait for a decisive move above Rs 90 before investing. Stylam Industries (Rs 42.1): The long-term support around Rs 7.5 arrested the stock's decline in October 2008 and it formed a strong base before trending higher. Since early 2009, the stock has been on an intermediate-term uptrend. Last week the stock recorded a life time high of Rs 44.7. However, experiencing selling pressure, the stock started to decline. It appears to have formed a medium-term peak at this level. Long-term investors can stay invested while maintaining stop-loss at Rs 26. An emphatic weekly close above Rs 45 can take the stock higher to the target of Rs 48 and Rs 57. A decline below the stop-loss would drag it further to Rs 17 or Rs 10 in the long-term. In the short-term, the stock can decline to the immediate level of Rs 38 and further to Rs 33 or Rs 34. 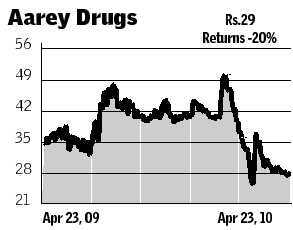 Aarey Drugs and Pharmaceuticals (Rs 28.9): This is a stock which moves in circuit to circuit. In January 2010, the stock met with a significant long-term barrier at Rs 60 and started to move southwards. Since then, it has been on medium-term downtrend. In February, the stock penetrated a key support at Rs 40 which later turned into an important resistance level. The stock has retraced more than 61 per cent of its prior up move, signalling possibility of testing January 2009 low of Rs 15 in next 6 months. Moreover, other indicators too project a bearish picture. Investors holding the stock can exit at current levels or in rallies to Rs 35 or Rs 40. Stop-loss can be at Rs 26. A tumble below Rs 26 would pull the stock lower to Rs 15 or to Rs 10 — a worst case scenario in the upcoming two to three quarters. 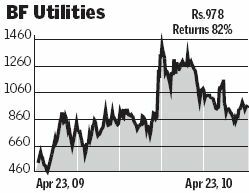 BF Utilities (Rs 978.25): BF Utilities is a momentum stock that moves rapidly in both the directions and is very volatile. The stock lost its bullish momentum when it touched an all-time high of Rs 3,395 in December 2006. Since then the stock has been on structural downtrend. Though the stock bottomed in March 2009 around Rs 270, it resumed its downtrend after retracing 38 per cent of the previous down-move in November. Investors with long-term perspective can stay invested as long as the stock trades above the stop-loss of Rs 700. The target for this period is the range between Rs 1,400 to Rs 1,450. Medium-term trend is down for the stock since November and it is currently hovering at an important medium-term trend deciding level. A move above the floor of the recent gap at Rs 1,050 would take the stock to next resistance at Rs 1,225. On the downside a plunge below the support of Rs 850 will accelerate the long-term downtrend and stock can fall to Rs 700. Comp-U-Learn Tech India (Rs 19.65): The price pattern since mid of February 2010 appears to be a formation of symmetric triangle pattern, which is a continuation pattern. Moreover, the stock has breached its moving average compression (21-, 50- and 200-day moving averages) at Rs 20.5 in the previous week. We advise an exit from the stock at current levels. The downtrend-line is intact and a downward breakout of the triangle pattern from Rs 19 will make it move from one circuit to another as it moves towards Rs 10 in the medium- to intermediate-term.